The Whisky Tasting Company work with whisky brand owners throughout Scotland and other countries so that they can offer a selection of premium, old and rare whiskies in beautiful whisky gift sets. They have their own bottling facility in the borders of Scotland. Their whisky gift sets are perfect as a gift for special occasions or as bespoke corporate gifts. 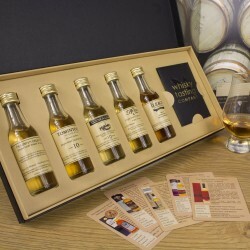 Sets include carefully selected whiskies together with whisky tasting cards and a guide to tasting whisky for an enjoyable and informative experience. They also offer a range of whisky gift subscriptions, which enable you to learn about and taste dozens of varieties annually.